The Evolution Electric Mini Quads are the perfect go anywhere, tackle anything companion. Rocking a tub-divider body shell, the rider will be protected from the various debris the outdoors can kick up. Whether it is mud, dirt, grass, water or rocks, the beefy air-filled All-Terrain Knobby Tires will drive through everything in its way. Turn the key, fire up the dual headlights, twist the throttle and go. The front and rear disc brakes, full suspension system and adjustable speed governor keeps things safely on course. The lead-acid battery (much safer than Lithium batteries) provides up to 2 hours of mini quad riding, whether it's on the pavement or off. Two motors are available and both are packed full of torque right from the starting line. The 350W motor comes with a 24V battery that provides ample power to get you where you need to go. Upgrade to the 500W motor and you get the more powerful 36V battery that will really turn up the excitement. And with either motor option, these electric mini quads are ready to ride, right out of the box. Just attach the handlebars with the included tools, adjust the tires, charge it up and go scouting, day or night! 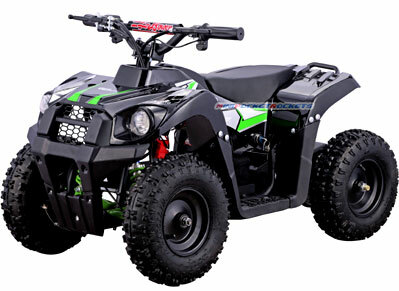 Included Free with Electric Mini Quads: Keys, Charger, Fuses, Tools, Tool Case, Starter Stickers, Owner's Manual and our free extended warranty.